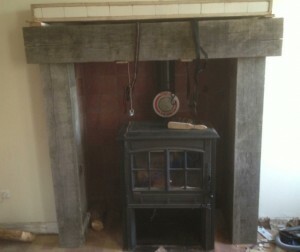 The timbers had recently been installed by a carpenter based on the clients instruction to create a rustic fireplace in his holiday home. French Limousin oak was sourced which had been cut 10 years ago and stored outside. 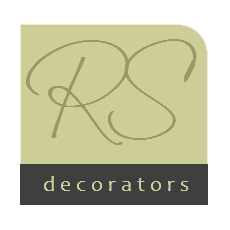 This was a great opportunity to put the Mirka Deros sander and extractor to the test. The client specified a dark oak varnish called Xylophene, which is available in France. This meant a lot of dust extracted sanding with the Mirka and Abranet abrasive. Starting with 80 grit and then a final sand with 120 grit. This provided a perfect smooth surface and brought the grain to life, which was hidden below 10 years of outdoor weather. We were instructed to create a false chimney breast above the timber to join to the existing wall. This was made from plasterboard and secured with plaster board adhesive. 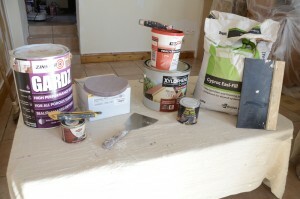 A coat of Gyproc Easifill was applied with a large flexible caulking tool across the board and allowed to dry. This was sanded and then re filled to create a smooth finish with nice curved corners. Thanks again to the Mirka sander and a 5mm interface pad behind the abrasive, it was an easy and virtually dust free task to create the curved corners. The holes from securing the timbers were filled with Toupret filler and Liberon dark oak filler to match the colour of the stain. As the chimney breast was to be re painted with Little Green intelligent mat it was necessary to apply a coat of Zinnser Gardz primer to the Easifill to seal the porous surface. We used a 2.5 inch Fox brush for this. Two coats of the Little Green intelligent mat were applied over this and to the surrounding wall. We used a 2.5 inch Picasso angled brush and a 6.5 inch Wooster pro dooz medium pile roller. The paint was mixed well and decanted into a Wooster speed bucket. Two inch 3M masking tape was used to protect the timber during painting. Three coats of Xylophene were applied to the timbers with a 2 inch straight cut Pioneer brush. It was imperative to hoover the cracks in the timbers before hand so the brush didn't attract dust into the varnish. We used a Mirka 915GB extractor for this. 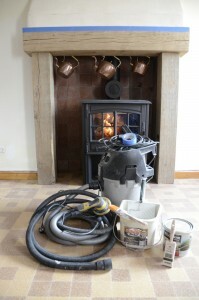 The enclosed log burner was quite old and tired so to finish we applied a coat of Rustins high heat mat black paint. 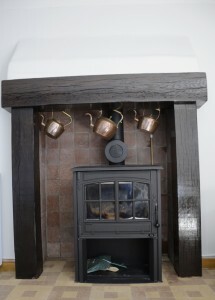 The overall finish created a rustic traditional fireplace in this country home which truly transformed the room.